With a seemingly endless supply of customizations available, each Porsche Carrera Targa 4 GTS is as unique as the person in the driver’s seat. Some people like window shopping. 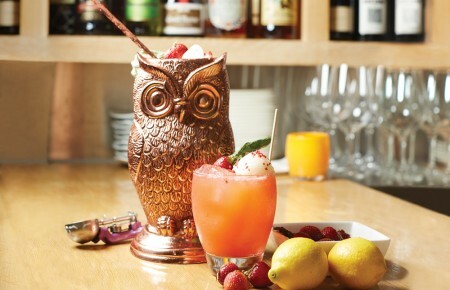 Others, like this writer, like to make quick decisions, get in and get out. 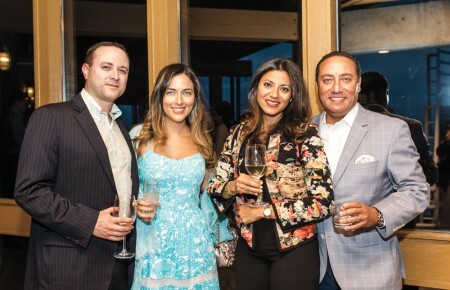 But Porsche has a way of encouraging its customers to spend their time comparing specifications, mixing and matching options and choosing between thousands of possible combinations to arrive at a one-of-one 911 that reflects the unique tastes of its owner. In our age of instant gratification, Porsche offers an alternative to “off-the-shelf” with the opportunity to build a very special car shared by no one else. So it is with our carefully-appointed 911 Carrera Targa 4 GTS, a sports car that you can enjoy year-round, drive every day in all kinds of weather (thanks to full-time all-wheel drive) and relish in the added excitement of dropping the top in just 20 seconds. Porsche brought their unique, basket-handled Targa roofline to market in 1967, offering the added safety of a permanent roll bar to protect occupants. While the snap-out plastic rear window was soon replaced with a giant curved glass backlight, the Targa model has remained in the 911 lineup in one iteration or another ever since. Named for the famous Targa Florio endurance race founded in 1906 and held in the mountains of Sicily, Porsche’s Targa marries the best of coupe and convertible worlds, automatically stowing the roof in an elaborate ballet of glass, fabric and metal. The 911 Carrera GTS is the most powerful of all Carrera models, featuring a 450hp engine (the Carrera S makes 420hp; the Carrera 370hp), and is available as a rear or all-wheel-drive Coupe or Cabriolet, and an all-wheel-drive Targa. In addition to the added power and the widest available bodywork (about two inches more than a standard rear-wheel-drive coupe), the GTS package ladles on a host of neat upgrades like front SportDesign bodywork, sport suspension, sport Alcantara interior and the purposeful forged 20-inch, one-piece, center-lock alloy wheels of the Turbo S. Priced from $139,900, our bright Guards Red car was a “check-most-of-the-boxes” GTS with an MSRP of $154,045. 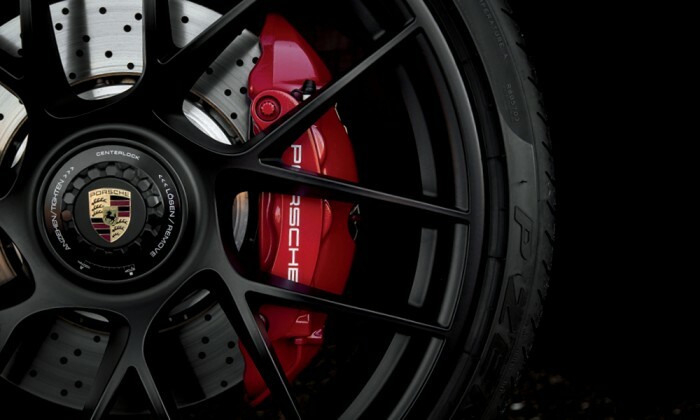 Porsche Ceramic Composite Brakes ($8,520) and the Front Axle Lift System ($2,590), absent on our car, are two nice-but-not-necessary options recommended for track and potholed roads, respectively. 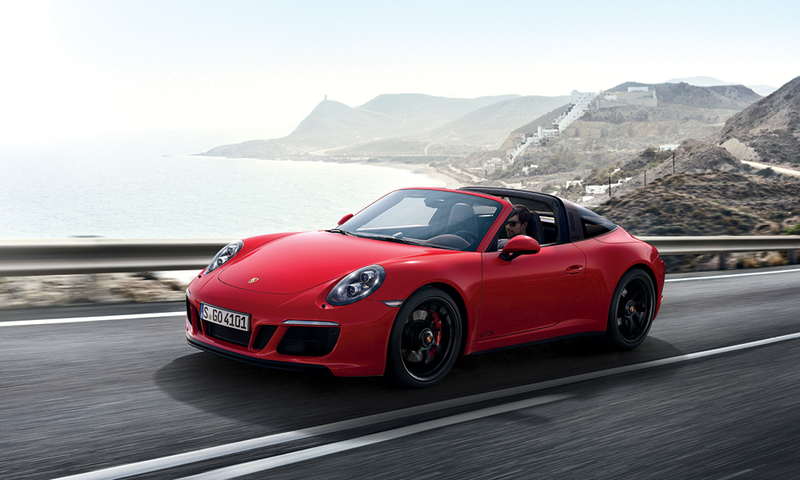 The Targa invites you to roll the top down—a feat achieved in 20 seconds—and cruise. Die-hard Carrera owners had their feathers ruffled when Porsche phased out the 911’s 3.8L, normally aspirated flat 6 in 2016 and replaced it with the current 3.0L twin-turbo—about the only way to gain more power while mollifying government watchdogs starving on an ever-lower emissions diet. Sure, this motor doesn’t have the endearing rocks-in-a-coffee-can soundtrack of its predecessor, but what it does have is loads more torque much lower down the rev range. Once experienced in concert with music from the standard sport exhaust system, it’s hard to deny progress, and those with a sentimental streak are advised to keep an air-cooled 911, 964 or 993 on hand. Porsche 911 shoppers are confronted not just with a large number of model choices, but a lengthy lexicon of acronyms, all beginning with the letter “P.” Each represents an important feature with tangible benefits to performance and safety. 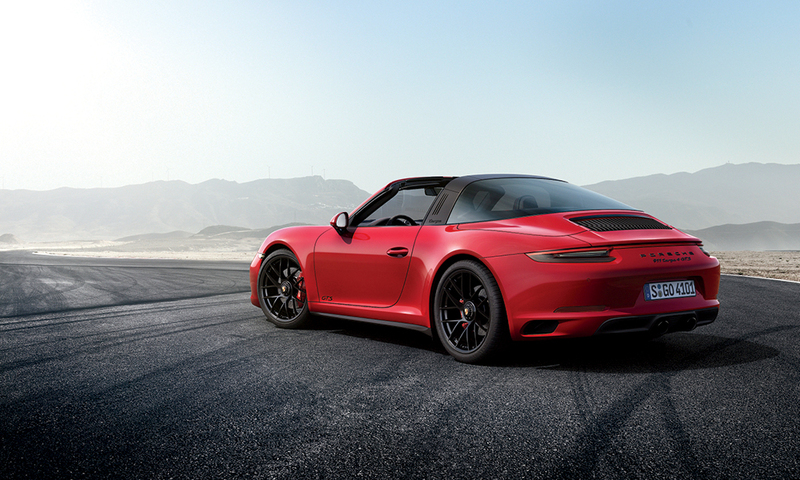 Revel in the power the Targa’s 450-hp engine offers, whether it’s cruising highways or winding down canyon roads. Our GTS Targa was equipped with the 7-speed Porsche Doppelkupplung automatic gearbox (thankfully, PDK will suffice), a $3,730 option preferred by most buyers. Paddle shifting or full-automatic modes give drivers seamless rev-matched shifts and take some pain out of stop-and-go traffic. For those among us who still prefer three pedals to two, PDK proves that performance and convenience are not mutually exclusive. Porsche Traction Management (PTM) is an active all-wheel-drive system that enhances road-holding and acceleration—even in rain and snow—by distributing drive force between the permanently-driven rear axle, with variable torque to front wheels. Porsche Active Suspension Management (PASM) is an electronic damping-control system that adjusts the suspension settings in real time. With it, the car sits almost a half-inch lower, though ground clearance is still adequate provided driveways and steep inclines are not approached head-on, but rather at an angle. The $3,170 option Porsche Dynamic Chassis Control (PDCC) reduces lateral body movement while cornering, letting drivers attack curves with greater precision and speed, which the GTS is easily prompted to do. Rear-axle steering is a $2,090 option that increases stability and makes the GTS even more agile in turns and tight quarters. Porsche Stability Management (PSM) optimizes more extreme driving limits, while Porsche Torque Vectoring (PTV) on manual and Porsche Torque Vectoring Plus (PTV Plus) on PDK cars regulates rear differential lock and moderates brake pressure to the rear wheels generating maximum stability and adhesion. Finally, the Porsche Dynamic Light System (PDLS) incorporates Bi-Xenon headlamps that swivel in sync with steering angle and speed, improving visibility during nighttime drives on curvy roads. It’s a neat trick. One wonders how we’ve gotten along without all this hi-tech hand-holding, but truth be told, the ability to push performance to higher limits with greatly improved safety margins is a winning formula for drivers at every skill level. Amazingly, Porsche has kept the essence of the 911 experience consistent for more than half a century. And that essence is an almost telepathic response to steering input and power delivery that is now more instant and impressive than ever before. Revisiting local canyon roads with sweeping curves and occasional decreasing-radius corners is a revelation in a 450 horsepower 911 with all-wheel drive, inspiring confidence to keep power on longer and harder than in a rear-wheel-drive Carrera. Empty freeway onramps are a thrill ride, culminating in a crescendo of acceleration as one merges with, and quickly overtakes, other cars. Every moment behind the GTS’s sport wheel—especially with its Sport Chrono knob clicked to SPORT PLUS—is a visceral experience, yet one tempered with a practical side. Comfortable Sport Seats Plus, great visibility out front and plenty of elbow room make long drives a pleasure. 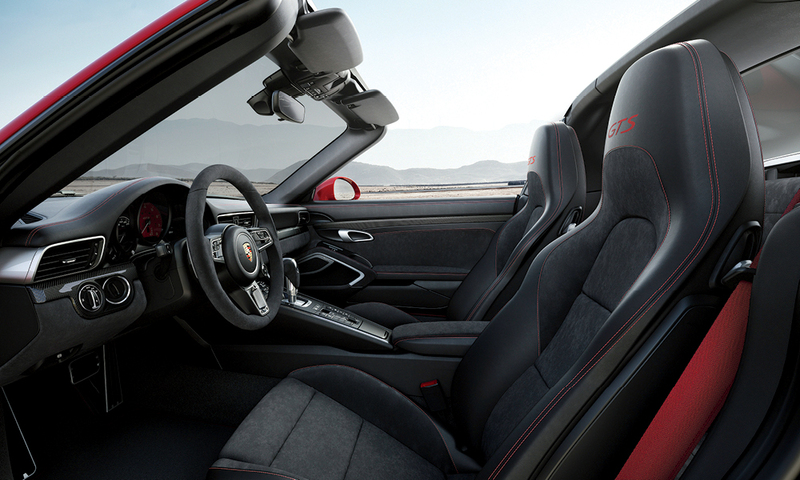 Put the Targa’s top down, settle in and go. Because along life’s automotive journey, everyone should check the “911 box” at least once.